This is my ultimate comfort food. It's what I turn to when I'm feeling a bit drained and not really in the mood for spending ages in the kitchen. I don't know about you, but when the Friday commute home finally rolls around the only thing I want to do is get in my pyjamas, bury myself under a pile of blankets on the sofa and eat a big bowl of comforting, delicious food. I'm pretty sure Deliciously Ella wrote this recipe with just those moods in mind. Yes, I know, white carbs are normally a no-no because they leave you bloated and feeling a bit like a big slug but on this particular day all I had in the cupboard was white pasta (sacrilege!) so that's what I went with. I know some of you are thinking "Do I really need to make my own pesto, can't I just buy the fancy one from Waitrose?" and my answer is "No you can't! They're not even in the same league!" This creamy, nutty, tangy pesto takes less than 5 minutes to make, you can just whip it up whilst your pasta is boiling (and we all know waiting for pasta to boil is 12 minutes of sheer boredom) and I can guarantee that once you've made your own pesto you'll never look back. When I first saw the recipe for this I questioned the amount of lemon juice in it, I was imagining it to be more of a slap in the face than a comforting, calming bowl of food. Oh how wrong I was, the lemon juice makes it fantastically fresh and vibrant, it balances the raw garlic flavour and cuts through the olive oil making this a very light pasta dish. 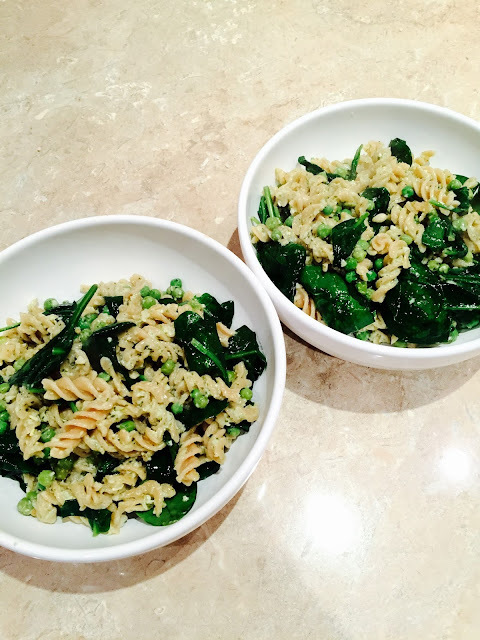 The addition of spinach and peas means this speedy dinner is actually full of energy giving iron, important vitamins, protein and fibre. Considering this takes less time than cooking a pizza (no excuses), I think that's pretty impressive! Next time I make this I'm going to try sprinkling over some hemp seeds to give it a big hit of protein. Enough pasta for 4 people, brown rice or wholegrain pasta is best but I won't judge if you use white! 1. 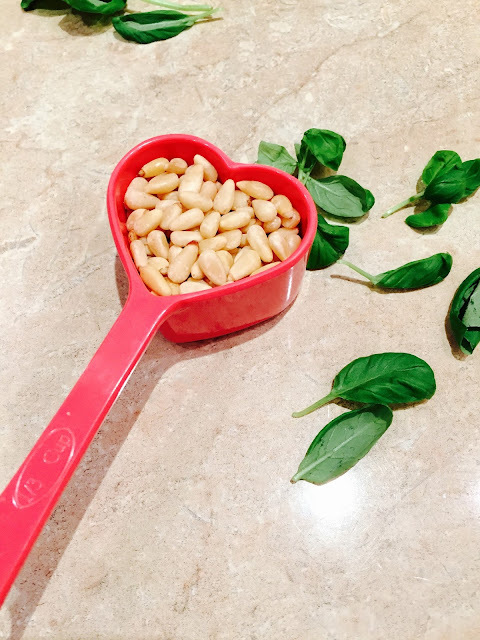 Add the basil leaves, not stems, to your food processor, along with the pine nuts, oil, peeled garlic, juice of both lemons and blend until smooth. 2. Boil peas in small sauce pan. 3. Cook pasta to packet instructions in large saucepan. Once drained pour back in to pan and add the spinach, peas and pesto. 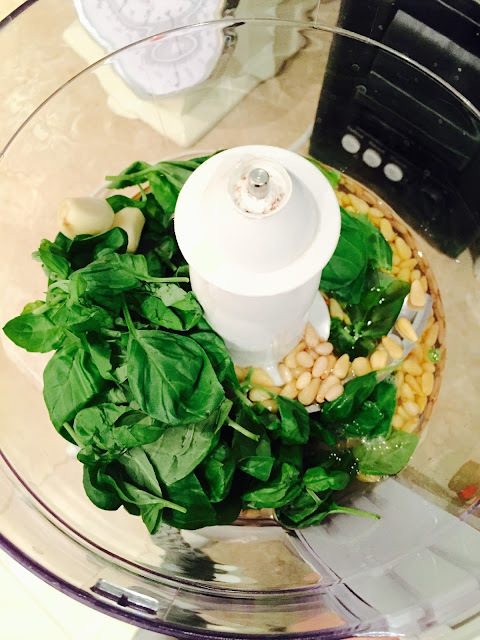 Mix around until spinach is wilted. What's your favourite comfort food?